Can you refer me to a source on how LEDs are produced, the colors, and practical aspects of how they can be incorporated in new or existing circuits — including LED types, requirements, and precautions? An LED is a specialized diode — one that has a conduction band that’s much higher than a silicon or Schottky rectifier diode. When a forward diode goes into conduction, the electrons are excited to a higher energy level. When the electron returns to its former energy level, it emits a photon. In an ordinary diode, the energy gap is small and most of the photon energy is emitted as infrared radiation — where it’s dissipated as heat. LEDs are specially constructed (Figure 1) to release a large number of photons, from infrared to ultraviolet. The color of the light is dependent on the energy level of the photon — which is directly related to the band gap. The more energy it takes to start conduction through the diode junction, the higher the energy of the photon and the shorter the wavelength. (Longer wavelengths, typically 700 nm and longer, emit infrared light; shorter wavelengths of 400 nm and shorter emit ultraviolet light.) The band gap (and resulting wavelength) is determined by the semiconductor material used to fabricate the diode junction (Table 1). TABLE 1. Typical LED Construction. 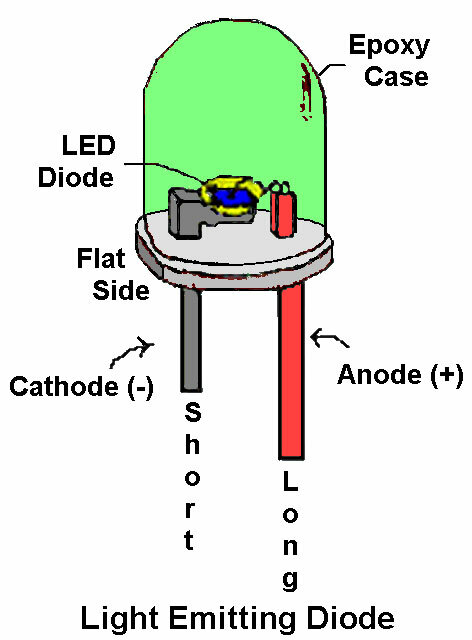 Because LEDs are diodes, they are polarity sensitive, as shown in Figure 2. In the forward direction they conduct, in the reverse direction they block current flow. The amount of current going through the LED determines its brightness. More current, the brighter the LED.